I’ve wanted to write a blog about the possible restructure of the game in this country for some time and, as you may have noticed, it’s started to raise its ugly head again. It is inevitable that at some point over the next couple of years the RFL will adjust the league formats and there has been some talk already this year that it could happen as early as next season. This is the final season of the RFL’s current three year cycle of allowing automatic promotion and relegation back into Super League by way of their revolutionary ‘Super 8’s’ concept. In a way, the system has done what it was designed to do as is evident from Leigh Centurion’s rise into Super League and, already this early in the season, it looks a foregone conclusion that Hull KR are too strong for the Championship and will be fighting for a spot in the Million Pound Game if not having already been promoted by virtue of a top three finish in the Qualifiers. If they do win promotion at the first attempt, and well done to them if they do, the RFL may decide to stick with this concept for a while longer. 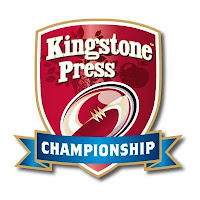 I’ve got no problems with the Super 8’s/Qualifiers format in itself but I feel that Hull KR are already a SL standard club and, only if the likes of London Broncos or Featherstone Rovers joined them in Super League next year, would I be confident that this format is actually working. I did like the idea of where they were going with it, but the slogan they tried to sell the concept with – “Every Minute Matters” – got lost somewhere in the final rounds of the campaign as clubs had all but secured their league positions by the time of the split. Particularly in the ‘Super 8’s’ there were a lot of dead rubbers later on in the season for me. However, this season seems to be a bit livelier earlier on, particularly in Super League, where games have been increasingly hard to call. The Championship is having that same effect with the likes of Toulouse and Rochdale doing so well early on and even League 1 is looking exciting with some names inside the top half that we haven’t really seen there before. It’s still very early days in all three divisions so we’ll wait and see how it pans out by Rounds 23 and 15. Another aspect that has raised its head over the last few weeks is the possibility of some top-end National Conference League clubs being promoted into League 1. Performances by those teams over the last couple of years have shown that they are fully capable of holding their own against clubs that are often lower down the League 1 table and, if it happens, it would hopefully show that the NCL clubs have not been forgotten. Also, the press release that was published by the RLIF last week brought some interesting ideas to the fore. As international rugby league is pretty close to my heart as well, the concept of a 9’s World Championship, the Emerging Nations World Cup, and the possible return of the Great Britain touring side is all very exciting stuff but will it ever happen? That brings me on to the reason I’m writing this blog - the structure of the game in this country. A few months ago I was reading up on Toronto Wolfpack, who would be venturing into competitive rugby league in our League 1, and happened to extend my research into the leagues they have in North America, predominantly the USA. I noticed that the 12 or so rugby league clubs were split into the typical American sports style of divisions and conferences, between four and five teams in each division, who then play a number of games before qualifying for the Play-offs by virtue of finishing top of their divisions and conferences. My brain got ticking and I started wondering if this could be worked into our system and whether supporters and clubs would like this idea. Rugby league has been going through a bit of a stale period over the last few years and needs something that would bring the interest back into our game and provide some much needed income for the clubs that have struggled financially. I decided to try and split the 40 current professional sides into three larger divisions and see if it would be viable to split each division into conferences based on America’s style. If we take Super League first I believe it could work as a 16 team league split equally into two geographical conferences. To make things simple, I decided to keep this season’s SL teams in here with the addition of the four teams that competed in last season’s Qualifiers - Hull KR, London Broncos, Featherstone Rovers and Batley Bulldogs. When plotting those teams on a map I found the easiest way of splitting them was to try and go for the old Lancashire and Yorkshire style divisions as there would be eight Yorkshire sides and the rest from made up of four from Lancashire, two from Cheshire plus London and Catalans. This was only an idea but another option would be making it literally east and west of a central line between all the clubs. If we did that, Batley and Huddersfield would be in the Western Conference and Catalans and London part of the Eastern. The idea would be that teams and supporters would have fewer miles to travel for games in the first part of the season and there would be more enticing derbies and, hopefully, more income for the clubs. This structure would not be set in stone and could be chopped and changed in future seasons depending on the location of the clubs that year and to break the monotony of constantly playing derbies. The first stage would compromise playing every team within their conference twice plus an inter-conference ‘Magic Weekend’ game for 15 games. The top four from each Conference would then qualify for the ‘Super 8’s’ and play each other once for seven more matches, starting again from zero points, and the same would apply to the bottom eight who would play in a ‘Super League Shield’ group. The final Play-off stage would see two sets of top fours, with semis and a final for the Super League and Shield titles, which could be set as a double header at Old Trafford on the last weekend of September. The interesting part would be the bottom of the SL Shield group where two teams would automatically be relegated and the sixth place team would play third place in the Championship in the ‘Million Pound Game’. Therefore the outcome would be that no SL team would play more than 24 league games in a season, with the season starting in early March and the World Club Series continues to be played at the end of February but as a season opener (as long as the NRL clubs remain interested!). The Championship would be based along the same lines as the Super League season and could pretty much run concurrently with SL. The clubs that I have selected to play at this level are purely the eight teams from last season’s Championship Shield, the top seven from last season’s League 1, plus Toronto Wolfpack (who should have won promotion to the Championship for next season anyway) and are by no means a show of favouritism on my part. Again I have split the clubs on the basis of east and west. I could have put Toulouse into the Western Conference and moved Keighley to form another all-Yorkshire Eastern Group but felt the western teams probably wouldn’t appreciate having to travel to two foreign venues so early in the season. As in SL, the first stage would compromise playing every team within their conference twice plus an inter-conference ‘Summer Bash’ game for 15 games. The conferences would then split into ‘Championship 8’s’ and ‘Championship Shield’ and play each other once for seven more matches. The difference comes in deciding which team is considered to be the ‘third placed’ Championship team for a place in the Million Pound Game but the but the easiest way of deciding that would be to base it on final league positions between the two clubs not contesting the 'Grand Final' after the full 24 rounds and semis. Again two teams are automatically relegated with the sixth placed Shield team playing a play-off match to decide the final promotion spot. League 1 proved slightly more tricky to determine which teams would compete in it but I picked it from the bottom eight League 1 clubs and top six NCL clubs from last year, and two ‘others’ to make up the 16 places. The six clubs from the NCL would be joined by Newcastle Thunder and Manchester Rangers (who have aired hopes of joining League 1 in the near future anyway) to make an eight team ‘Northern Conference’. The seven remaining southern teams could be joined by last season’s Southern Conference champions London Chargers to make up the eight ‘Southern Conference’ teams. I felt that splitting the league in this way would provide more opportunities for the non-heartland teams to enjoy a better experience compared to what they usually see these days of travelling back from the north deflated after suffering heavy defeats. Hopefully having the ability to play against teams of a similar standard with less travelling earlier on will help them build their confidence and be able to attract more fans, build a winning mentality and feel ready to face the heartland teams in the latter part of the season (I hope I didn’t sound to patronising there?). Because it would be run on a similar basis to the SL and Championship, League 1 could then introduce their own ‘Magic/Summer Bash’ weekend and would therefore play a total of 24 games before play-offs. This brings us on to the Challenge Cup. The current format of nine rounds would be able to stay with the first and second rounds both being played in February and the Final remaining on August Bank Holiday weekend. Each of the early rounds could have up to 32 teams in each which would allow more clubs from the community and regional game to be allowed in and give them the experience of playing in a top level competition. It could also give the lower league clubs a better chance of meeting a top Super League side if all the clubs from the same division enter the round together which hasn’t been the case in the last few years. The first difference that came to mind for the Championship clubs would be the introduction of a Championship Cup, similar to that currently played by League 1 clubs, which would give second tier teams a chance of winning some silverware of their own. The finals of both competitions could be held at a neutral venue the same weekend as the Challenge Cup Final, possibly at another venue in London if not Wembley, and fans could purchase a ‘weekend ticket’ which would allow them to see all three games. This leads on to my final thoughts on what the international calendar could look like. I like the concept of having a full international break mid-season. It’s probably not to everyone’s taste but hear me out on this. As a country we have often berated the RFL for not giving our English players more time together in an international team environment. Therefore, two weeks out of the season at a training camp and playing an international match against a top tier nation in May would hopefully work wonders for the national team in the long run. The Aussies and Kiwis play each other every summer so why can’t we get a regular fixture in place against another Pacific Island nation, France, or even a home nation? By starting the season a week or two later there would also be room for a possible 9’s tournament at the start of the year, similar to that which is played in Australia, which would hopefully build interest for the coming season. This could be played at a neutral venue or even moved around the country each year to try and showcase rugby league to the rest of the British Isles. Let me know in the comments below what your thoughts are on what I’ve said. I don’t mind if you like it or loathe it but I just thought it would make an interesting read.